If you’re a follower of the growing analytics movement in football you’ll probably have heard of the term ‘expected goals model’. The term may have been shortened to ExpG, xG or something, but whatever it’s been named, it’s basically a shots model. What’s a shots model, then? A shots model puts a theoretical goal value on a shot that a team or player takes during a game. The value of a shot is either 0 (no goal) or 1 (a goal) isn’t it? So what’s the point? Yep, the final outcome is always 0 or 1. However, in order to better analyse teams (and players) it’s not really good enough to say x scored 55 goals this season and y scored 60. It still begs the question of why that was the case. Did x have less shots? Did y have easier chances? Ok, you can count up shots, but how do you quantify how easy a chance is? We can begin to assign an ‘expected goal’ value for each shot by looking back into history. Not all shots are the same, so you have to group similar ones together. How often over time is the same type of chance converted? Working this out will give us an ‘expected goal’ value. Personally, I’m not sure I like the term ‘expected’ goal – it’s more of an average benchmark score to simply compare each team or player’s shots. However, expected goals is how it’s mostly referred to so I’ll stick with. Surely there are too many variables to just lump shots together like this? Each expected goals model that you come across will have different inputs. All of them use the location of where the shot was taken from. However, each model will be different in how detailed its location data is. Some models will take into account how the ball was delivered to the person making the shot (through ball, cross etc), and some will take into account whether the shot was made by foot or by header. Some models take into account all shots (on target, off target, blocked) and some take into account ball placement (in the corner, straight down the middle). What’s missing from all models in the public domain is defensive positioning – where are defenders in relation to the shooter? However, some modellers talk of adding ‘game state’ into the mix as a proxy for this – conversion rates vary depending on the scoreline (the theory being teams change the balance of their attack/defence based on what the score is). So what does your model use? Is that it? How much data have you got? Yep, that’s it – I want to keep the model as simple as possible to understand while still having something that works. I have over 13000 shots on target recorded covering the last four Premier League seasons. How do you apply the data? 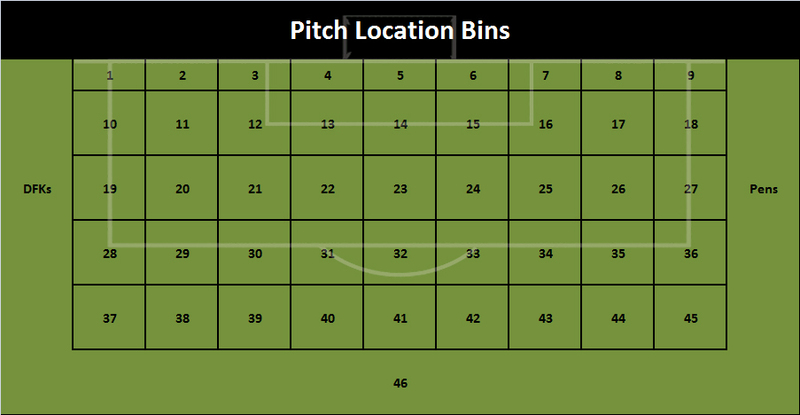 As I’ve said, those 13000-odd shots have been put into the 46 location bins plus the direct free kick and penalty ones. That gives me an average goal value for each of those shot location bins. For example, a shot on target from bin 14 is worth a theoretical 0.59 goals. If a team gets a shot on target from bin 5 it’s worth a theoretical 0.91 goals. I can then tot up a team or players shots over a season to find out what the average team/player benchmark would be for those shots. I’m still not sure where this is going? Prozone’s Omar Chaudhuri has shown on his blog 5addedminutes why goal difference is a good indicator of the sustainability of a team’s long term results and why sometimes, the league table does lie. If the relationship between Expected Goal Difference (ExpGD) and Actual Goal Difference is strong, and the relationship between Actual Goal Difference and Actual Points is strong, then it follows that ExpGD matters when it comes to placings and points in the league table. Man United’s ExpGD was in the 20s in the first three years of this model. This year it was less than 12. Man City’s ExpGD in the first year of this model was barely over 2. It ballooned into the 30’s and 40’s the last three years and they’ve won the league twice in that time. Liverpool’s ExpGD started in the late teens in the first year and it’s risen every year since and into the 30’s this season. Arsenal are the opposite of Liverpool and is posting ever decreasing ExpGDs. Arsenal keep having to battle right to the end to ensure Champions League football whereas previously it was almost a given. These baseline numbers matter – they are a great explanation of what actually happens over time. If we looked at these team’s possession figures, it wouldn’t tell us anywhere near the same story. I tested the correlation of all teams’ possession% with its goal difference during the same period in the Premier League. The r2 value was a much lower 0.546. Is the model any good at predicting what’s going to happen the following season? Again the relationship looks decent with an r2 of 0.7082. However, there’s some whopping outliers – Man City’s hugely positive change from 2010/11 to 2011/12 being the main one. How about predicting what’s actually going to happen the following year? Again that Man City improvement in 2011/12 alone make the figures look worse than the overall trend might actually be. 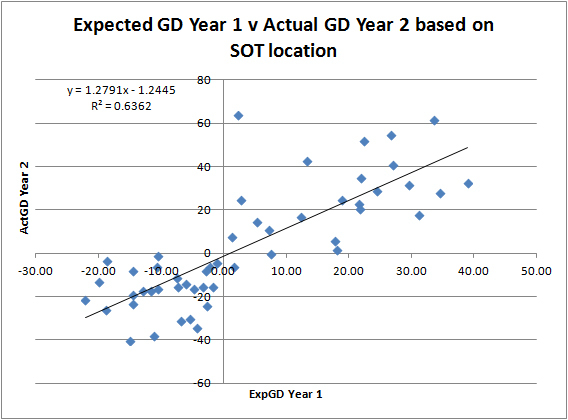 I expect to be able to show a better predictive value of ExpGD as more data is added to the model as seasons go by. 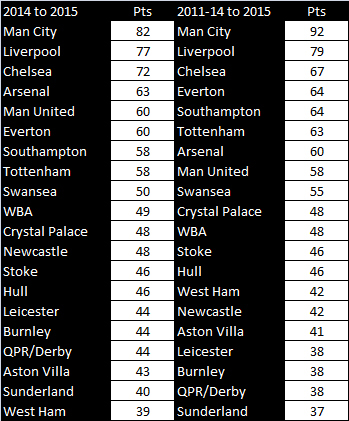 For the purposes of the newly promoted teams I just used the average of previously promoted teams ExpGDs. I also used the formula in that Omar Chaudhuri piece I mentioned up top, to simply convert GD to points. Got any comments, questions or criticisms? I’m sure you have. My aim is to try and make the analytics movement as open as possible. I’m still learning myself every day and continually try to make things as understandable as possible. Inevitably things still turn out too mathy, but it comes with the territory. Get in touch on Twitter @footballfactman or comment below. 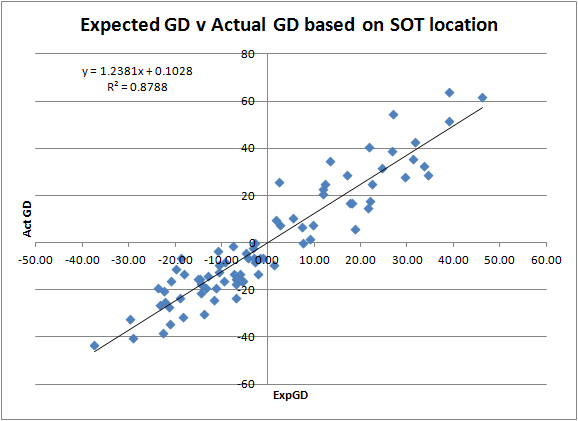 This entry was posted in Sports and tagged expected goals, expected goals model, Man City, repeatability. Bookmark the permalink. Excellent piece. I think the huge problem to predict what is going to happen next season is coach and player changes. For instance, Man United probably will play different football with new coach and new players next season. Nice and explanatory! 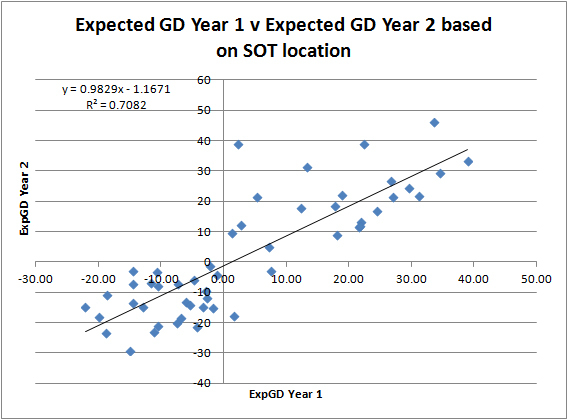 Wrong name on the y-axis in ExpGD y1 vs ExpGD y2 chart. I, too, have recently embarked on building an ExpG model, specifically with the view of investigating the appropriateness of using ExpG as a measure of phases of pressure during a game (perhaps something similar has already been done – I’m slowly working my way through the great work in the public domain). Can you recommend useful data sources or is endless hours of data entry something us enthusiasts have to just grin and bear? Great post and well explained. Out of interest, where is the location data coming from. Also, could you briefly explain why Shots Off Target are not counted. Very interesting article, particularly how the data started to spread as you went from ExpGD v ActGD into trying to predict for future seasons. Out of interest, how did you work out the theoretical goal value for each of the different bins? See reply to other comment! Like it! Very interesting. Any chance of sharing the data (you effort would be gratefully acknowledged). I would like to fit a non-linear model to get what I believe would be additional useful insights on the subject. Thanks! why would you not include the ‘shots’ that are off target? If I shoot and I miss the target from one specific spot in the box and then I have another 10 shots from that same spot for the rest of the season and I score 7 and another 3 are saved, that means I’ve had 11 shots and only scored 7. on target, off target, it doesn’t matter. you have to consider the off target shot otherwise you’re overstating your conversion ratio. If it is definitely a shot, then it MUST be considered. Data collation leaves room for interpretation and that’s where variability will lie. Hi there! Thanks a lot of sharing info! I am working in a observational sheet and in the order to implement some functions for the data analysis I would like to practice a bit with some data which has been already analyzed, maybe I didnt express myself good enough. Could you reupload the sample?